I shared a table with the author of American Sniper at the Millbrook Literary Festival yesterday. 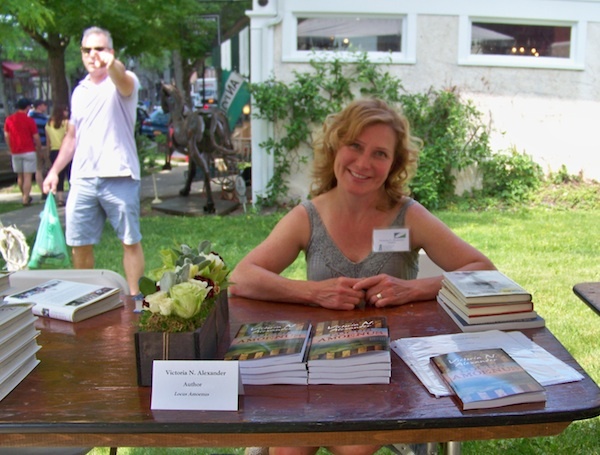 Here I am getting photobombed by a man pointing to the celebrity author. I thought this was significant, somehow, since my novel, Locus Amoenus, is anti-war. I had a great day. Sold out of the paperback pre-view copies. This entry was posted in literary fiction and tagged #9/11novel, #americansniper, 9/11 novels, american sniper, anti war, Jim DeFelice, literary festival, locus amoenus on May 31, 2015 by VN Alexander.